Postcards From The Smokies » When is the Peak Fall Color in the North Carolina Smokies? 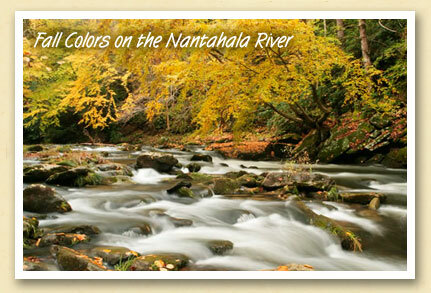 When is the Peak Fall Color in the North Carolina Smokies? It’s the question of the month from callers to the Bryson City Chamber of Commerce. And the answer is “You can see fall color just about anytime from early October through early November. You just may have to drive to see it.” That’s because the arrival of peak color varies with the elevation, which ranges from 2000 to more than 6000 feet in Swain County. Autumn’s annual color show is already making its way down from highest elevations of the Great Smoky Mountains National Park, where the climate is more like New England’s. And over the next three weeks, the above display will be repeated throughout the the Smoky Mountain landscape with the grand finale coming around the end of the month. The only spoiler could be a heavy thunderstorm, which could bring down the curtain early. But right now, it’s shaping up to be quite a show.